This is a different Photograph, no locomotive. Signals at the end of a large station. Distinctive buildings in the background. Which station, which platform? What does the 'S' signify on the smaller signal arms? Not sure, but the location does look like the North end of Preston Station. The 'S' on the signal arm would usually indicate that, when cleared, the driver could pass it for shunting purposes as opposed to taking a main line route, for example to shunt a carriage from 1 train to another. Local arrangements could however exist, so the specific meaning could be directing to 'Sidings' or even 'Shed'. I am sure one of your signalling experts will know! Try south end of Stockport Station, perhaps? This is Stockport, looking south from the end of Platform 1. The tunnels were removed in 1958/9; I think the date of the photo is c1950 – before 1956 anyway. Quote from "A pictorial Record of L.N.W.R Signalling" page 97 plate 7.13. "A three doll short arm bracket signal of the S61 type at the south end of Stockport Station in August 1953. Shunt ahead signals are provided below the centre and right-hand dolls for shunt moves from the platform. The shunt function is denoted by the letter 'S' attached to the arm, this was a LMS addition (as was the use of this type of arm for the shunt function) again introduced as an aid to drivers. The 'S' on the left-hand arm has practically corroded away however! Note the separate distant arms by the tunnel mouths only a few yards ahead of the platform signals. Photo: G H Platt." This is certainly Stockport. Equally, there is no doubt whatsoever about what the signal marked �S� was for. There were three kinds of subsidiary signal. Each one had a distinct purpose – that is, there was only one use for each type – so that those running the railway knew, without any doubt or confusion, what each one meant. Their uses were laid down in the Rule Book. Rules 44, 45 and 46 are headed �Subsidiary Signals�. Rule 44 is sub-headed �Calling-on Signals�, Rule 45 �Warning Signals� and Rule 46 �Shunting-ahead Signals�, which is why enginemen used to remember these three kinds of subsidiary signal as �CWS�. Rule 44 states: (a) Calling-on signals, where provided, are placed below stop signals and when lowered authorise the Driver to proceed forward cautiously and indicate that the line towards the next stop signal (or buffer stop where there is no signal in advance) is occupied. The lowering of the calling-on signal does not authorise the next stop signal to be passed at Danger. (b) Except where authorised, the calling-on signal must not be lowered until the train has been brought to a stand at it. Rule 45 states: (a) Warning signals, where provided, are placed below stop signals, and when the warning signal is lowered the Driver must understand that the line is clear only as far as the next stop signal. The lowering of a warning signal fixed under the signal controlling the entrance to the section ahead must be taken as an indication that the section is clear to the next home signal but that the station or junction ahead is blocked, and the Driver must regulate his speed accordingly. (b) The warning signal must not be lowered until the train has been brought quite, or nearly, to a stand at it. Rule 46 states: Shunt-ahead signals, where provided, are placed below the signal controlling the entrance to the section ahead, and, when lowered, authorise the latter signal to be passed at danger for shunting purposes only, and a train must not proceed on its journey until the signal controlling the entrance to the section has been lowered. So the signal marked �S� in the photograph is a �Shunt-ahead� signal and could only be used as in Rule 46. 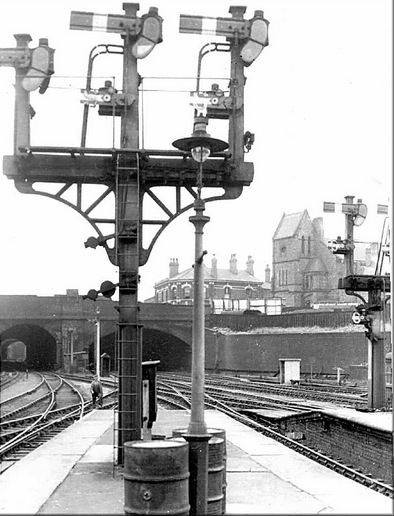 From ex BR Relief Signalman - This is definitely a photograph of the track layout at the southern end of Stockport (Edgeley) Station before the tunnels were removed. All the above comments are entirely correct (except Preston of course). The signals were the Up Slow Homes for Stockport No.1 SB worked by levers 9 to 13 in that box. There were no up Starting signals at No.1, so these signals controlled the entrance to the block section to Edgeley Junction No.2 SB, which is just the other side of the tunnel. The left hand arm (lever 13), with the points from Up Slow to Up Goods, was removed by 1957. The remainder were replaced by a colour light signal on Sunday 26th June 1960. Mike Bentley's explanation of Rules 44, 45 & 46 is correct for the date of this photo, but strictly only correct for the period from 1950 until 1972. From 1.7.37 until 1.1.50 there was an additional type of subsidiary signal known as Draw-Ahead - and the term "calling-on signal" was used only in connection with Permissive Block (ie allowing a train into an occupied block section). Before 1933 the Rule Numbers were all different, as was the precise text (C-O was Rule 43; S-A was Rule 46, quoted on p94 of "LNWR Signalling"). Warning Signals were devised later and did not appear in the Rule Book until 1933. The principles were much the same, though. LNWR c-o arms and s-a arms were quite different; c-o were a distinctive small signal ("LNWR Signalling" fig 7.8 and plates 7.9 & 7.10) while the s-a function was given by a main line type arm of reduced size (plate 6.6). From about 1915 a new type of small arm was used for s-a arms and latterly for c-o as well. From the early 1920s both were replaced by the type af arm shown in the photo, with a C or S. The first experimental Warning arms appeared about 1927.